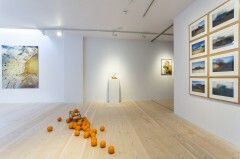 Following a £1.4million expansion project, Delfina Foundation re-opens its doors with The Politics of Food, a four-year residency project exploring ways creative process and practice can address issues around food, agriculture and the environment. “We will start in the kitchen!” So declared the global Slow Food movement in 1989 with its manifesto for a new way of living, linking the pleasures of eating with a commitment to community and the environment. It is with a similar belief in expansiveness and conviviality, with an awareness of the interrelation between agriculture and culture, that the newly re-opened Delfina Foundation‘s inaugural theme-based residency will develop. The project begins this winter with a group exhibition of work by current residents and others, complemented by an extensive programme of workshops, meals, performances and debates. Next year, research and production will take place in the spring, the following year in summer and so on – three-month periods of concentrated activity followed by a pause for thought. Cezar hopes this structure will allow for new partners and collaborators to come forward as ideas and practices evolve. The Foundation’s aims are to promote cross-cultural dialogue, to forge enduring international relationships and to give artists time – to interact, experiment and open up their practice from the haven of a ‘home’. The Foundation’s conjoined Edwardian townhouses – the result of a major expansion project jointly conceived by London-based Studio Octopi and Shahira Fahmy Architects in Cairo – nestle in a corner of a picture-postcard terrace in Victoria, London. When I visit on the day of the press breakfast, the airy, glass-panelled reception rooms are abuzz with preview chatter. The gentle trickle of Abbas Akhavan’s pots and pans water fountain combine with sounds from the actual kitchen as tea and coffee, cakes, fruit and sugar stress balls by US artist Candice Lin are served. On the ground floor, Leone Contini stages a tea intervention, infusing a blend of Jasmine, Chinese and black teas to make reference to the changing (agri-)cultural landscape of the Tuscan city of Prato. 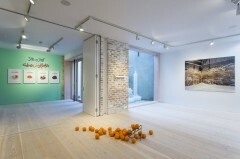 In the downstairs galleries, photographic and moving image displays are punctuated by stray oranges from Senam Okudzeto’s installation Porte-Oranges; in the small basement courtyard, Gayle Chong Kwan’s stalagmitic Wastescape catches the morning light. 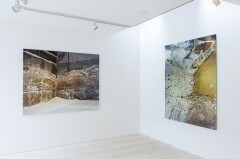 The refurbishment has transformed Delfina Foundation into London’s largest international artist residency provider, with capacity for eight guests plus 1,650 square feet of exhibition and event space. Architect Shahira Fahmy was herself a one-time resident artist. “I lived here, I understand how it feels and how important it was to maintain a sense of homeliness,” she says. Many of the houses’ period features have been conserved – sash windows, exposed brickwork, fireplaces and hearthstones, fragments of wallpaper and, importantly, the building’s scale and proportions. Says Studio Octopi’s James Lowe: “It wasn’t about carving out a space for a huge white cube gallery, it was about working with the building, to retain aspects of its history.” The result is a sleek yet unpretentious interior that belies the ambition and scale of the Foundation’s work. 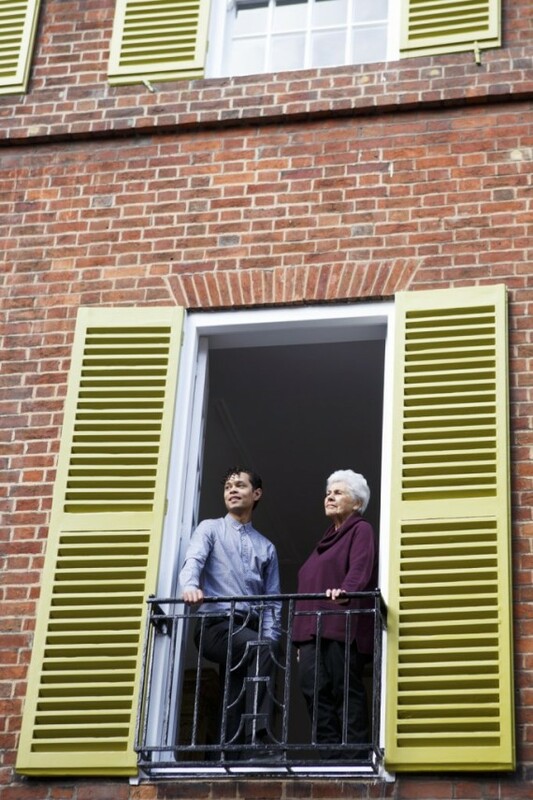 It is, though, perhaps the presence of Delfina Entrecanales herself – the 86-year-old ‘art grandmother’ who founded the legendary Delfina Studio Trust in 1988 – that really makes this house feel like a home. Petite and elegant, the famously publicity-shy Spaniard captures everyone’s attention, her smile inviting us in. Homing and feeding artists has been central to Delfina’s project since its inception. The original Delfina Studios, based in a converted chocolate factory in Bermondsey Street until it closed in 2006, included living quarters for international residencies and a restaurant with an artists’ table, providing subsidised lunches and a meeting point for sharing ideas. Time and space: Residencies – Introduction to different kinds of residencies and what they have to offer for creative and career development, plus Guides to proposals by Judith Winter. Gayle Chong Kwan: Underground exchanges – 2008 feature by Charles Danby exploring how Gayle Chong Kwan developed avenues of exchange centred on relationships with food through a community-based residency facilitated by Platform for Art.